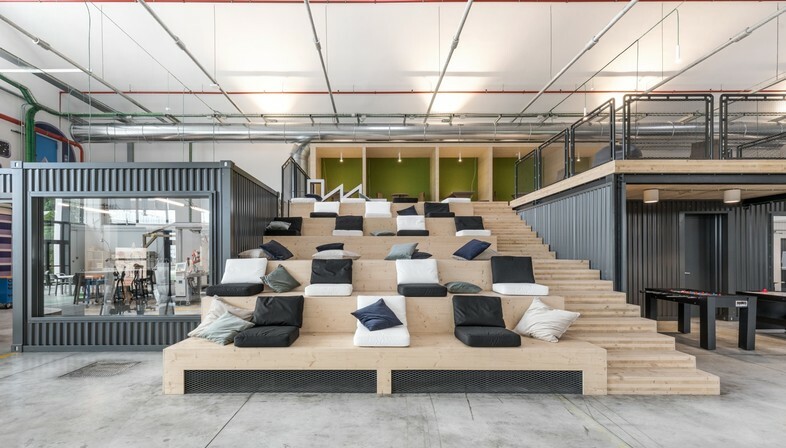 DEGW, a Lombardini22 Group brand concerned with integrated workspace design, renovated the interior of the Electrolux plant to create a new coworking space that draws on the site’s industrial history. Contamination is the keyword in interpreting the Innovation Factory Electrolux project in the Electrolux plant in Porcia (Pordenone) by DEGW, the Lombardini22 Group brand concerned with integrated workspace design. The architects of DEGW have transformed an abandoned old building into an energetic, vital workspace in a project that enhances the industrial appearance of the historic headquarters of the Zanussi Group, founded by Lino Zanussi in 1954 and acquired by the Swedish multinational Electrolux in the 1980s, giving it a new coworking space. 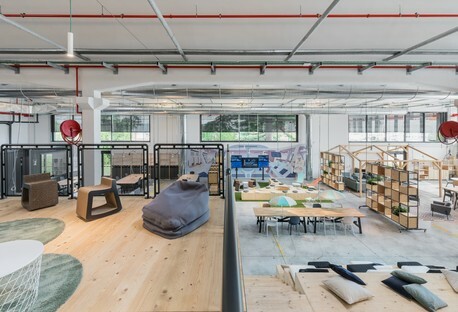 The Innovation Factory is a 1000 sqm space obtained by renovating the first building in the historic plant of the former Zanussi Group, now Electrolux, in Porcia – Pordenone. 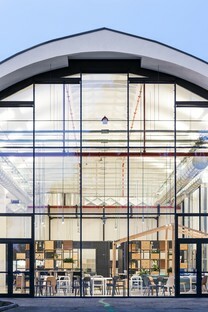 The architects preserved the industrial look of the site, retaining the volume of the original building and a number of prestigious details such as the original floor and vaults, while creating a new space “contaminated” by the flexibility, operating methods and comfort in demand in today’s workspaces. The project makes use of a few simple materials associated with the site’s industrial past: bare concrete, glass, untreated wood and sheet metal, plus synthetic and natural greenery. These primary materials determine the definition of surfaces and furnishings that create different theme areas and operative premises in the single big 1000 sqm space of the Innovation Factory: an innovative contemporary space where the industrial atmosphere is echoed in exposed utility installations, untreated surfaces and materials and furnishings of simple design. Everything contributes to the creation of an interior the architects describe as “rough” but which is actually only apparently so, as every little detail has been carefully designed on the basis of visual and practical considerations. The space is characterised by a series of distinct areas configured separately and bounded by mobile dividers or furnishings of various kinds, which are always connected to one another and designed to be highly flexible; just moving a few components around is enough to create a new configuration and adapt the spaces to future new requirements. The architects have even allowed for potential expansion of the space by leaving gaps between adjacent areas. The layout, in sequence from the entrance of the Innovation Factory, is as follows: a self-service coffee bar with an adjacent kitchen on the glassed-in side, which is visually connected with the building’s exterior. In the centre of the space are a relaxation area with a gazebo of wood creating a cosy, homely atmosphere, and a creative area on a synthetic lawn with a real tree in the middle, casting shade over simple seats surrounded by mobile open-shelved backdrops. The big wooden steps aligned with this space lead up to the mansard terrace, which provides access to little enclosed booth for working with greater concentration and confidentiality while enjoying a view over the entire area. The space is completed with an operations area containing open workstations, a start-up area with more private workstations, a 250 sqm prototyping and 3D printing lab, a conference hall and an informal “flexy area”. Project team: Alessandro Adamo (Client Leader), Giuseppe Pepe (Design Leader), Benedetta Sartori (Architect).